Cloud Connect Archives - VIRTUALIZATION IS LIFE! Cloud Connect has become the central mechanism for connectivity and communication between multiple Veeam services. 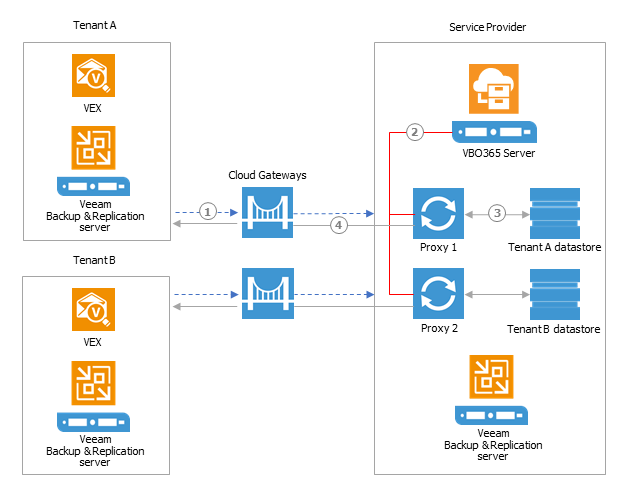 When first launched with Cloud Connect Backup in v8 of Backup & Replication, the Cloud Connect Gateways where used for all secure communications between tenant backup server instances and the Veeam Cloud and Service Provider (VCSP) Cloud Connect backup infrastructure. This expanded to support Cloud Connect Replication in v9 and from there we have added multiple products that rely on communications brokered by Cloud Connect Gateways. With regards to acting as the broker for Cloud Connect Backup or Replication, prior to Update 4 the only way in which a VCSP could design and deploy the Gateways was in an all or nothing approach when it came to configuring the IP address and DNS for the service endpoint. When considering VCSPs that also provide connectivity such as MPLS for their customers it meant that to leverage direct connections that might be private the options where to either use the public address or setup a whole new Cloud Connect environment for the customer. 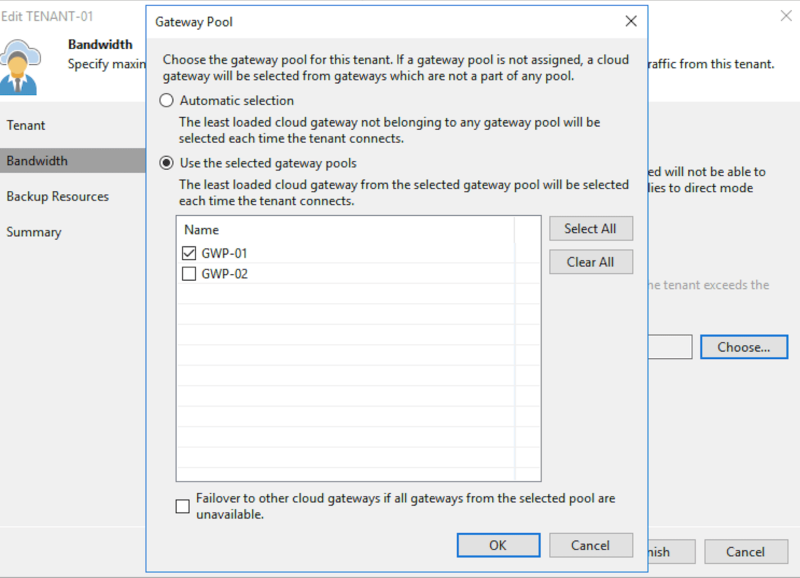 Now with Update 4 and Gateway Pools a VCSP can configure one or many Gateway Pools and allocate one or more Cloud Connect Gateways to those pools. From there, tenants can be assigned to Gateway Pools. 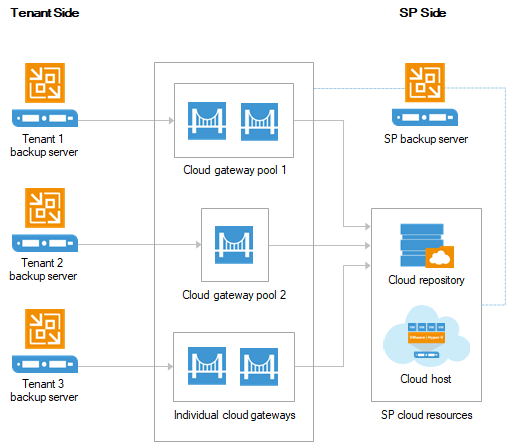 Cloud Gateways in a Gateway Pool operate no differently to regular Cloud Gateways. 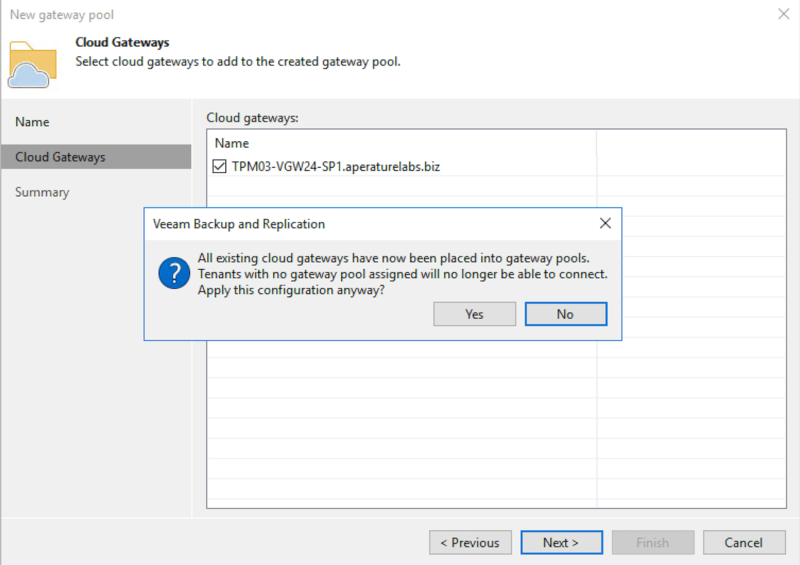 As with previous Cloud Gateways, If the primary gateway is unavailable, the logic built into Veeam Backup & Replication will failover to another Cloud Gateway in the same pool. If tenants are not assigned a Cloud Gateway Pool they can use only gateways that are not a part of any cloud gateway pool. That situation is warned in the UI when configuring the gateways. The introduction of Cloud Connect Gateway Pools un Update 4 was undertaken due to direct feedback from our VCSPs who wanted more flexibility in the way in which the Cloud Gateways where deployed and configured for customers. Not only can they be used to seperate tenants connecting from public and private networks, but they can also be used for Quality of Service by assigning a Gateway Pool to specific tenants. They can also be used to control access into a VCSPs Cloud Connect infrastructure if located in different geographic locations. For a great overview and design considerations of Cloud Connect Gateway Pools and Gateways themselves, check out Luca’s Cloud Connect Book here. 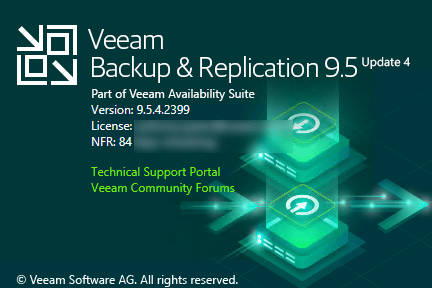 When Veeam Backup & Replication 9.5 Update 4 went Generally Available a couple of weeks ago I posted a What’s in it for Service Providers blog. In that post I briefly outlined all the new features and enhancements in Update 4 that pertain to our Veeam Cloud and Service Providers. 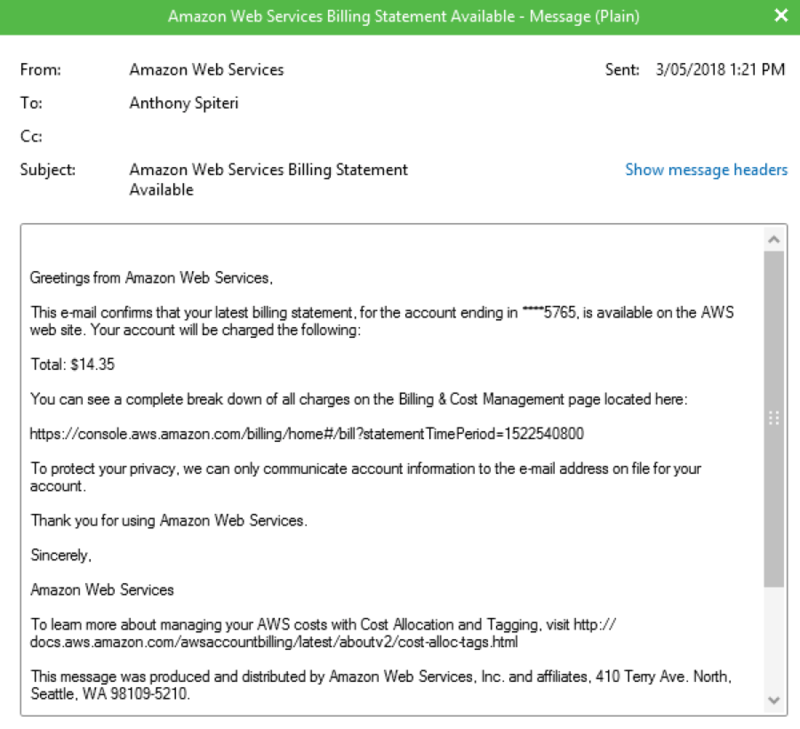 As mentioned each new major feature deserves it’s own seperate post and today I’m kicking off the series with what I feel was probably the least talked about new feature in Update 4…Tape as a Service for Cloud Connect Backup. When we introduced Cloud Connect Backup in version 8 of Backup & Replication we offered the ability for VCSPs to offer a secure, remote offsite repository for their tenants. When thinking about air-gapped backups…though protected at the VCSP end, ultimate control for what was backed up to the Cloud Repository is in the hands of the tenant. From the tenant’s server they could manipulate the backups stored via policy or a malicious user could gain access to the server and delete the offsite copies. 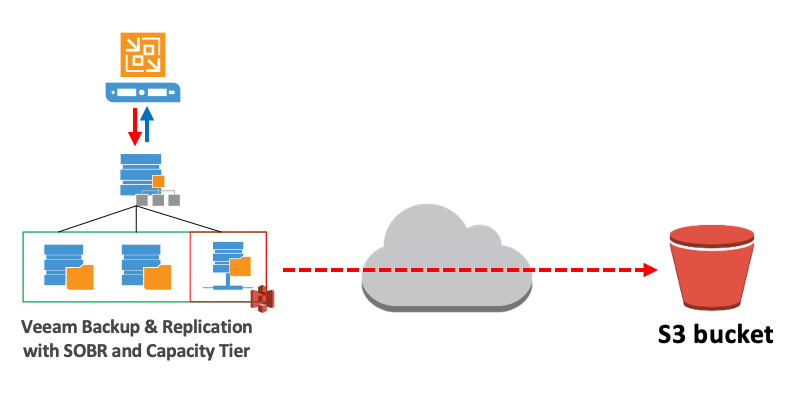 In Update 3 of Backup & Replication 9.5 we added Insider Protection to Cloud Connect Backup, which allowed the VCSP to put a policy on the tenant’s Cloud Repository that would protect backups from a malicious attack. With this option enabled, when a backup or a specific restore point in the backup chain is deleted or aged out from the cloud repository. The actual backup files are not deleted immediately, instead, they are moved to a _RecycleBin folder on the repositories. In Update 4 we have taken that a step further to add true air-gapped backup options that VCSPs can create services around for longer term retention with the Tenant to Tape feature. This allows a VCSP to offer additional level of data protection for their tenants. The tenant sends a copy of the backup data to their cloud repository, and the VCSP then configures backup to tape to send another copy to the tape media. If there is a situation that requires recovery if data in the cloud repository becomes unavailable, the VCSP can initiate a restore from tape. VCSPs can also offer a tape out services to help their tenants achieve compliance and internal policies without maintaining their own tape infrastructure. Tapes can be stored by the service providers, or shipped back to tenant as shown in the diagram below. To take advantage of this new Update 4 feature VCSPs will need to configure Tape Infrastructure on the Cloud Connect server. What’s great about Veeam is that we have the option to use traditional tape infrastructure or take advantage of Virtual Tape Libraries (VTLs) which can then be backed by Object Storage such as Amazon S3. I am not going to walk through that process in this post, there are a number of blogs and White Papers available that guide you on the setup of an Amazon Storage Gateway to use as a VTL. 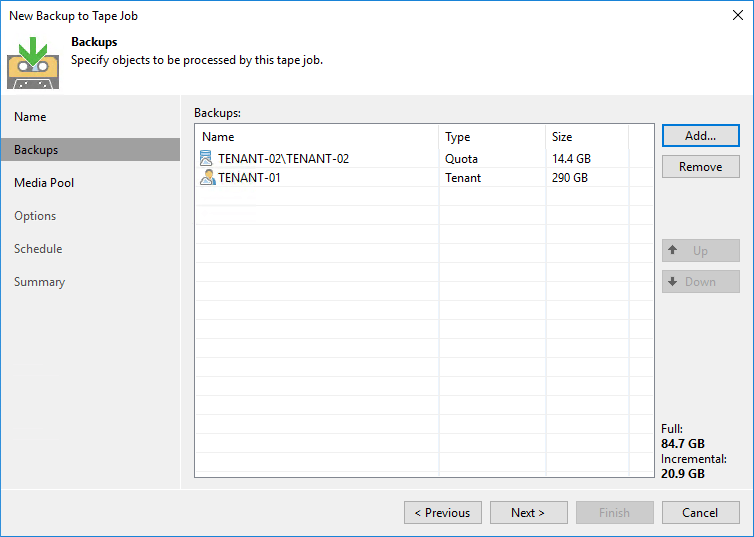 Once the Tape Infrastructure is in place, as a VCSP with a Cloud Connect license when you upgrade to Update 4, under Tape Infrastructure you will see a new option called Tenant to Tape. 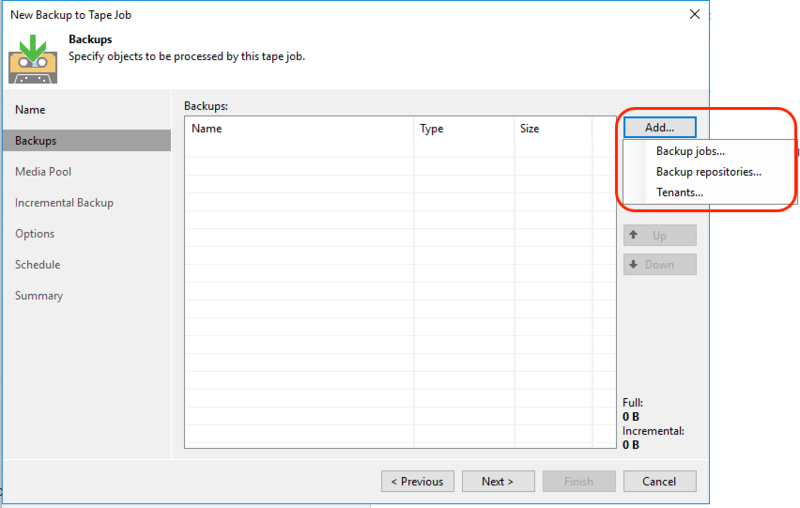 A tenant backup to tape job is a variant of a backup to tape job targeted at a GFS Media Pool which is available for Veeam customers with regular licensing. What’s interesting about this feature is that there are a number of options that allow flexibility on how the jobs are created which also leads to a change of use case for the feature depending on which option is chosen. 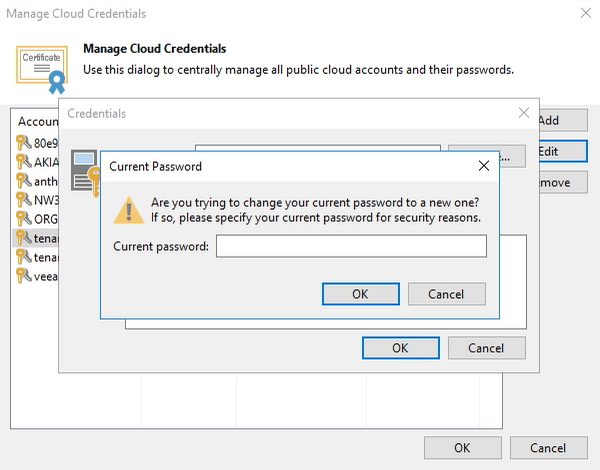 Choosing Backup Jobs will allow VCSPs to add any jobs that may be registered on the Cloud Connect server…though in reality there shouldn’t be any configured due to licensing constraints. The other two options provide the different use cases. This allows the VCSP to backup to tape one or more cloud repositories that can contain one or multiple tenants. The can allow the VCSP to backup the Cloud Connect repository in whole to an offsite location for longer term retention. 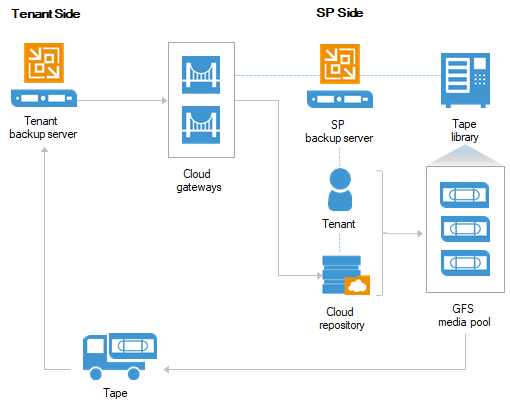 The ability to archive tenant Cloud Connect Backups to tape can help VCSPs protect their own infrastructure against disasters that may result in loss of tenant data. It can be used as another level of revenue generating service. As an example, there could be two service offerings for Cloud Connect Backup… one with a basic SLA which only has one copy of the backup data stored… and another with an advanced SLA that has data saved in two locations…the Cloud Connect Repository and the tape media. This option offers a lot more granularity and gives the VCSP the ability to offer an additional level of protection on a per tenant level. 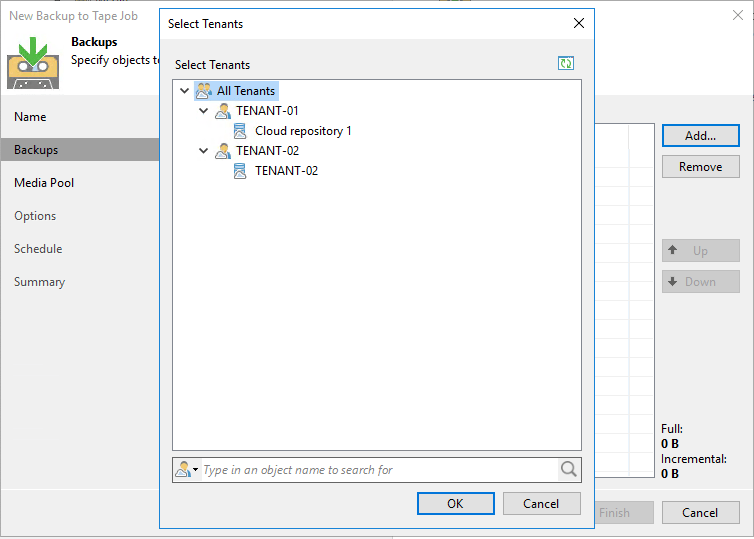 In fact you can also drill down to the Tenant repository level and select individual repositories if tenants have more than one configured. Again, this can be done per tenant, or there can be one master job for all tenants. It’s important to understand that all tasks within the tenant backup to tape feature are performed by the VCSP. Unless the VCSP has created a portal that has information about the jobs, the tenant is generally unaware of the tape infrastructure and the tenant can’t view or manage backup to tape jobs configured or perform operations with backups created by these jobs. There is scope for VCSPs to integrate such jobs and actions into their automation portals for self service. 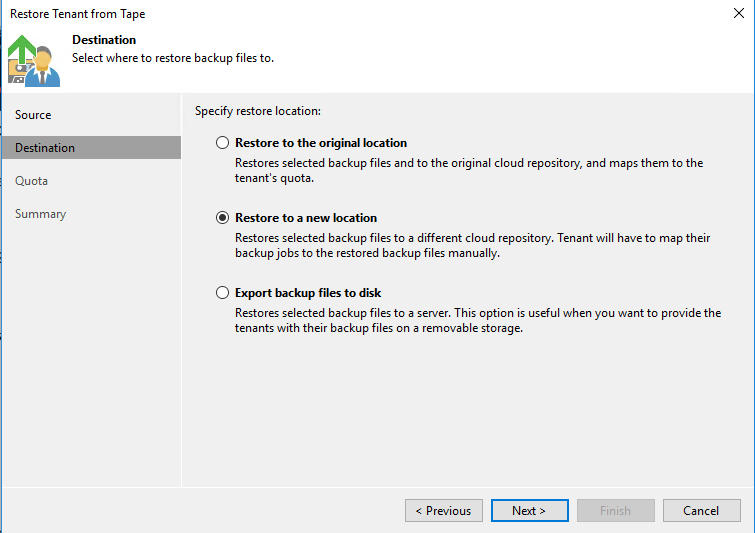 Tenant to Tape or Tape as a Service for Cloud Connect Backup was a feature that didn’t get much airplay in the lead-up to the Update 4 launch, however it give VCSPs more options to protect tenant data and truly offer an air-gapped solution to better protect that data. For ten plus years Veeam has continued to develop new innovative features and enhancements supporting our Cloud and Service Provider partners. As I posted earlier this week, there is a proven track record built upon a strong foundation of Veeam technology that backs up our strong leadership position in the Service Provider space. This accelerated in v7 with vCloud Director support…continued with Cloud Connect Backup in v8, Cloud Connect Replication in the v9 release and even more through the Backup and Replication 9.5 releases and Updates. Over the next few weeks I am going to deep dive into each of the features listed above as they all deserve their own dedicated blog posts. With a release as huge as this, there is no shortage of content that can be created off the back up Update 4! Beyond the core enhancements, there are also a significant number of general enhancements that are referenced in the What’s New Document. I’ve gone through that document and pulled out the ones that relate specifically to Cloud and Service Provider operations for those running IaaS and B/R/DRaaS offerings. Maximum supported individual disk size and backup file size have been increased 10 times. With the default 1MB block size, the new theoretical VBK format maximums are 120TB for each disk in backup. Tested maximum is 100TB for both individual disks and backup files. vPower NFS write cache performance has been improved, significantly improving I/O performance of instantly recovered VMs and making a better use of SSD drives often dedicated by customers to write cache. Instant recovery of agent backups to a Hyper-V VM now support Windows 10 Hyper-V as the target hypervisor. This is particularly useful for managed service providers by enabling them to create low-cost all-in-one BCDR appliances to deploy at their clients’ premises. What I pulled out above is just a small subset of all the general enhancements in Update 4. 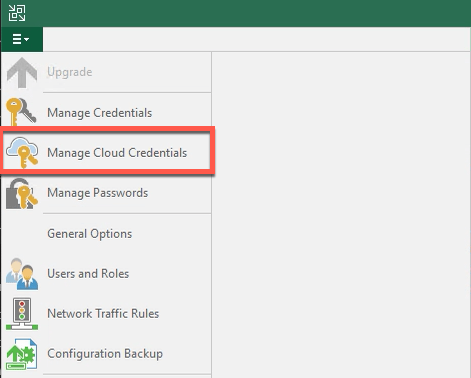 For Cloud Connect, there is a Post in the Veeam Forums here that goes through specific new features and enhancements in greater detail as well as fixes and known issues. Stay tuned for future posts on the core new features and enhancements in Update 4 for Veeam Cloud and Service Providers. Veeam for Service Providers…Ten Plus Years of Innovation! I remember the day I first came across Veeam. It was mid 2010 and I was working for Anittel at the time. We had a large virtualisation platform that hosted a number of high profile sites including a well known e-commerce site. There had been a serious data breach on one of those site and we were required by the Australian Federal Police to restore the website logs from a couple weeks back when the breach had first taken place. We were using a well known product at the time to backup our vSphere platform and from the outside everything seemed ok. All backup reports where green and we thought the backups where verified. To cut a long and painful story short, when we came to restore the website logs we found that the backups had not worked as expected and we couldn’t retrieve data off a secondary partition due to a huge unknown bug in the software. That was the end for that backup application (and interestingly enough they went out of business a few years later) and that afternoon we downloaded Veeam Backup & Replication v4 and went to work pushing that out into production. We (and I have) never looked back from there. Veeam did in fact Just Work! At that stage there were enough features in the software to cover all of the requirements for a VMware based hosting platform, and over the years as v5 and v6 were released more and more features and enhancements were released that made Veeam even better service providers. 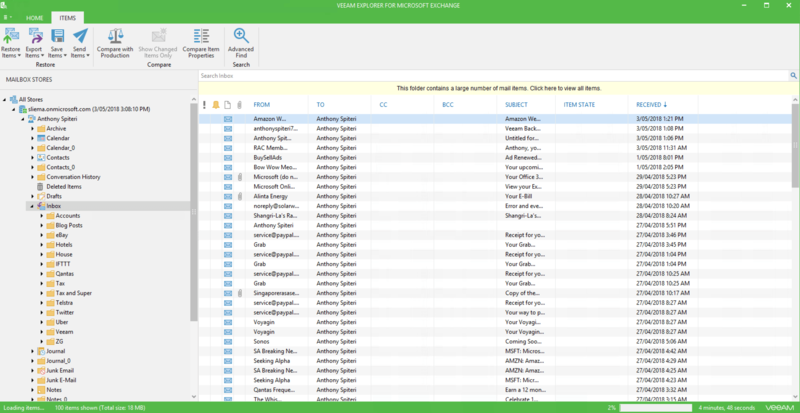 By the time I left Anittel and headed to Zettagrid, Veeam had introduced more innovative features like Instant VM Recovery, vCloud Director Support, Cloud Connect Backup, the Scale Out Backup Repository just to name a few. In fact Veeam impressed me so much with their Service Provider features that I joined the company where I now focus my time on working with Service Providers as part of the Veeam Product Strategy Team focusing on our cloud and service providers products and features. While I could bang on about all the features that Veeam has released over the years to enable us to become a significant player in the Cloud and Service Provider space, a picture tells a thousand words…and an interactive timeline showing just how innovative and focused Veeam has been on enabling our Cloud and Service Provider partners to succeed is priceless! No other vendor has this track record of producing specific Cloud and Service Provider features and enhancements over the years and as you can see over the last three to five years we have moved with the industry to continue innovating in the cloud space by accelerating feature development and bringing great technology to the market. If you are a Cloud and Service Provider and not using Veeam…what are you waiting for? VCSP Important Notice: 9.5 Update 4 RTM Is Out…With vCloud Director Replication Support and more! Today, Veeam has made available to our VCSP partners the RTM of Update 4 for Backup & Replication 9.5 (Build 9.5.4.2399). Update 4 is what we term a breaking update, meaning that if a Cloud Connect tenant upgrades from any previous 9.5 version before VCSPs this will break backup or replication functionality. With that in mind the RTM has been made available for our VCSP partners to ensure it is installed and tested before being pushed out to production before the GA release. 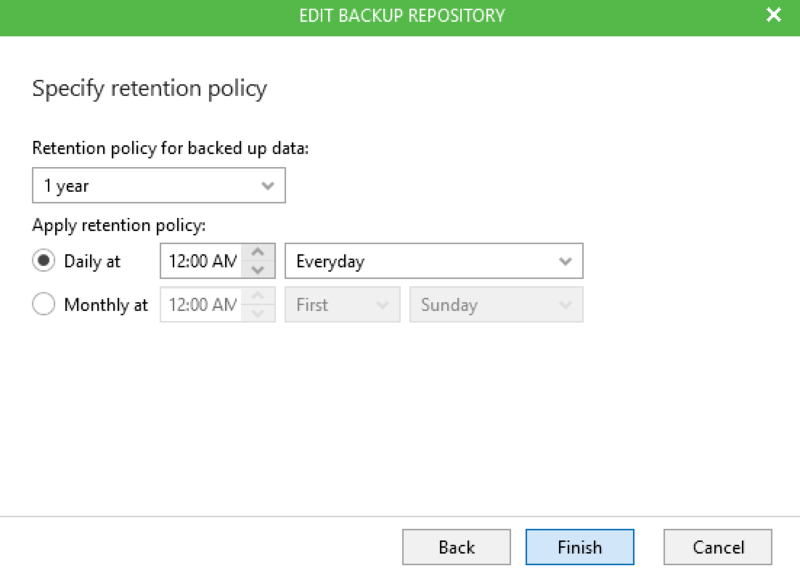 Veeam Backup & Replication releases from 9.0 (build 9.0.0.1715) can write backups via Cloud Connect to a cloud repository on 9.5 Update 4. 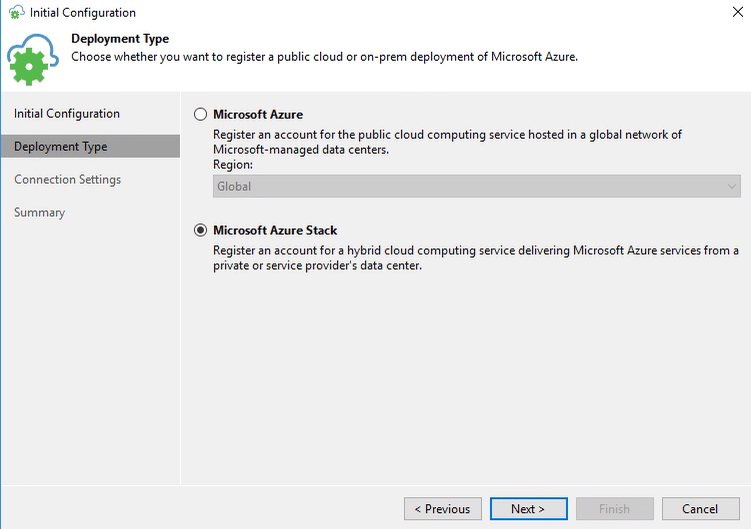 For Cloud Connect Replication, existing Hardware Plan based replicas can go to a cloud host on 9.5 Update 4. To take advantage of the new vCloud Director based replication, tenants need to also be on Update 4. 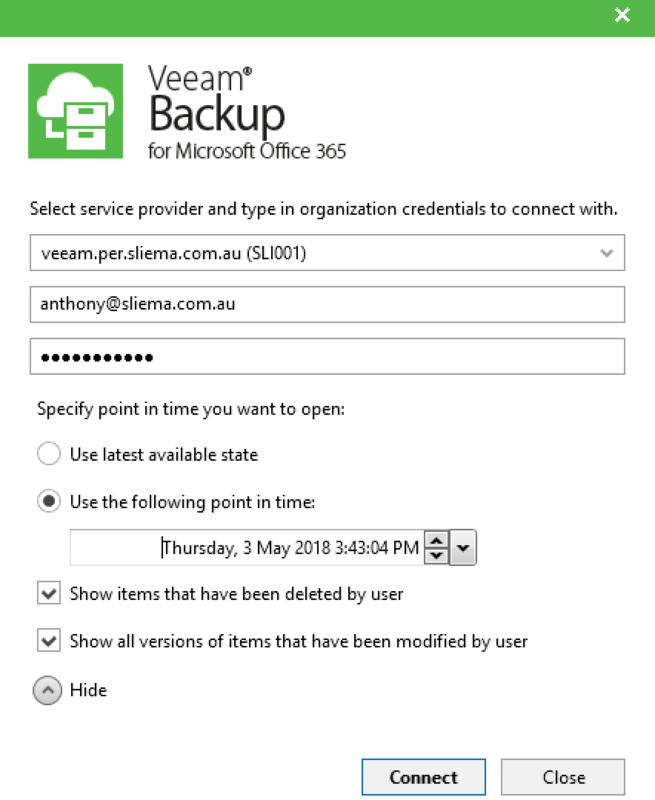 As I detailed yesterday, there are a number of updates that need to be applied to Veeam ONE, Veeam Availability Console and Veeam Backup for Microsoft Office 365. Update 4 is a very significant update and contains a number of enhancements and known issue fixes with a lot of those enhancements aimed at improving the scalability of the Backup & Replication platform that VCSPs can take advantage of. One important note is around the new Instance-based licensing model that all VCSPs should be aware of. There is an initial guide here, information in the VCSP Forums and there will be emails sent to explain the changes. Platform Support – vCloud Director 9.5, VMware 6.7 Update 1 and Windows 2019 (1809) support. There has also been a lot of work to improve and enhance scalability in the Backup & Replication Cloud Connect functionality to accomodate the increasing usage of Veeam Agent for Windows and Linux of which there is a new version (3.0) coming at the same time of Update 4 GA. For Veeam Availability Console, Update 4 will be taken advantage of fully in the upcoming major release a little later after the Update 4 GA.
Once again, Update 4 for Veeam Backup & Replication is an important update to apply for VCSPs running Cloud Connect services in preparation for the GA release which will happen in about two weeks at our Velocity event. Once released I’ll link to the VeeamKB for a detailed look at the fixes but for the moment, if you have the ability to download the update do so and have it applied to your instances. For more info in the RTM, head to the VCSP Forum post here. Important Updates for VAC, VBO and Veeam ONE … Update 4 is Coming! Things are moving here at Veeam with the impending release of Veeam Backup & Replication 9.5 Update 4. In preparation for the release there have been a number of update patches released for our supporting platform products. Importantly for our Veeam Cloud and Service Providers who are expected to receive RTM details any day now, it’s important to understand that the following patches need to be applied ASAP before your main IaaS Veeam or Cloud Connect instances are updated to Update 4. 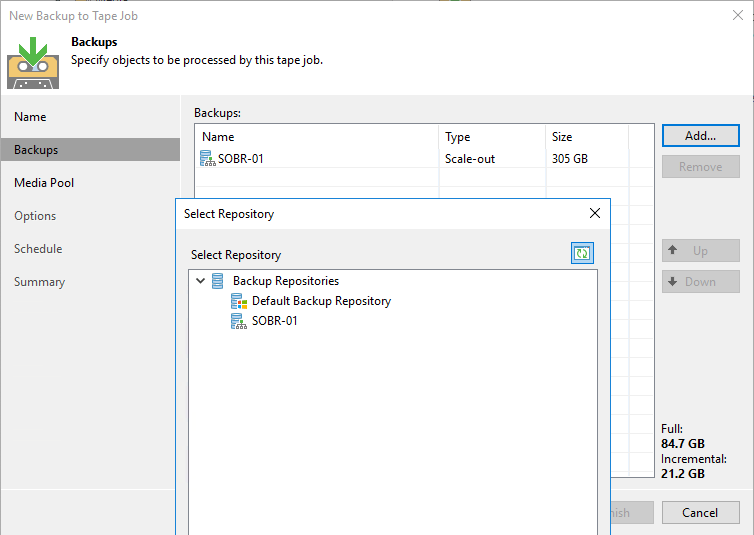 For Veeam ONE there is a little manual work to be done by way of an MSSQL script. If not executed before Update 4 is deployed, Veeam Cloud Connect monitoring and reporting in Veeam ONE 9.5 Update 3 will stop working. the patch update is a Cumulative Patch for Update 1 of 2.0. 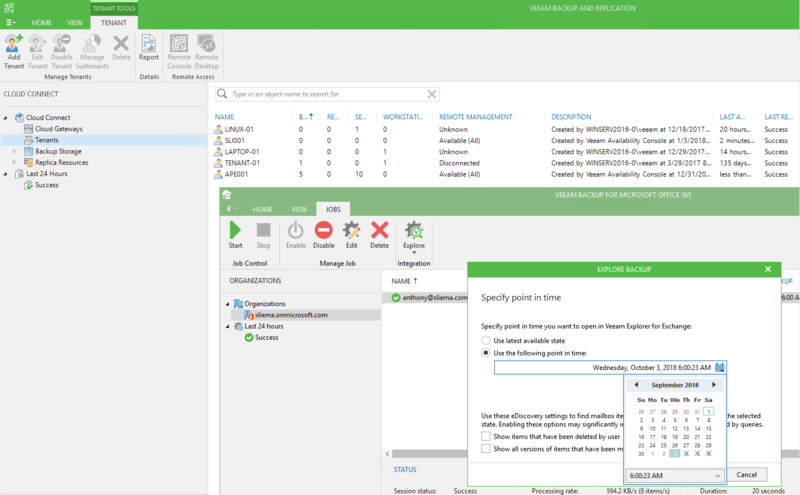 This adds immediate compatibility support for Veeam Backup & Replication 9.5 Update 4 as well as Cloud Connect 9.5 Update 4 compatibility support which is how VAC does it’s communicating between the server instance and remote sites for monitoring and management of remote Backup Servers and Agents. Note that there are new features in Update 4 which will not be supported in this version of VAC…the next major release of VAC will add supportability for those features not supported. As well as the Update 4 compatibility, there are also a number of resolved issues, the full list of which can be viewed in the VeeamKB. To apply the patch, head to the VeeamKB and follow the instructions. You need to have at least VAC 2.0 Update 1 Build 2.0.2.1750 as shown below. From there, make sure you have a backup of the database, close down the Web UI and execute all three MSI packages as administrator on the server. Once completed the patches are applied and VAC 2.0 Update 1 is up to date running on version number Server Version 2.0.2.1913. Note that updated Windows for Agent Builds have been pushed out and can be upgraded as per my post a few months back. 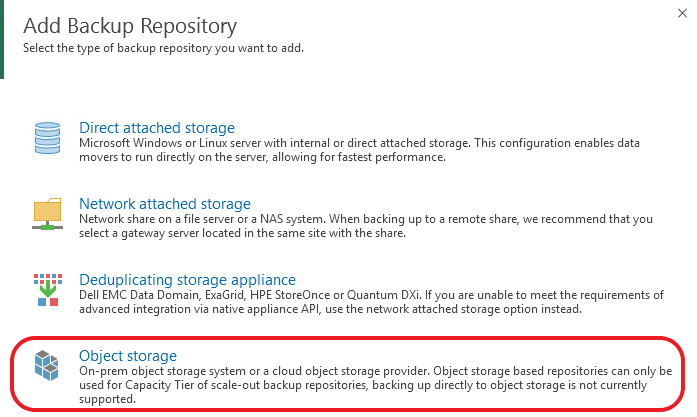 It’s important to note that standalone instances and also those installed ontop of instances with Veeam Backup & Replication Update 4, which would be most VCSPs who are utilising the Self Service feature through Cloud Connect need to be updated. DO NOT install on those running Update 3 or 3a. You need to running at least 2.0.0.567 or 2.0.0.594 before installing this cumulative patch before updating. Like the Update patch for VAC, this is a Cumulative Patch and also includes a number of important resolved issues relating to SharePoint and OneDrive, Exchange Online, restore operations and general server fixes. The full list can be found in the Resolved Issues section of the VeeamKB. For those with tenants that run the Explorers for Exchange or SharePoint seperate to an installation of Veeam Backup & Replication 9.5 or those running pre Update 4 versions, there are also upgrades for both contained in the patch release. All set for Update 4! With all that in place, VCSPs should be ready to deploy the RTM of Update 4 when it becomes available. Stay tuned for more information on that front. There is lots to love about Update 4 for Service Providers and customers alike!